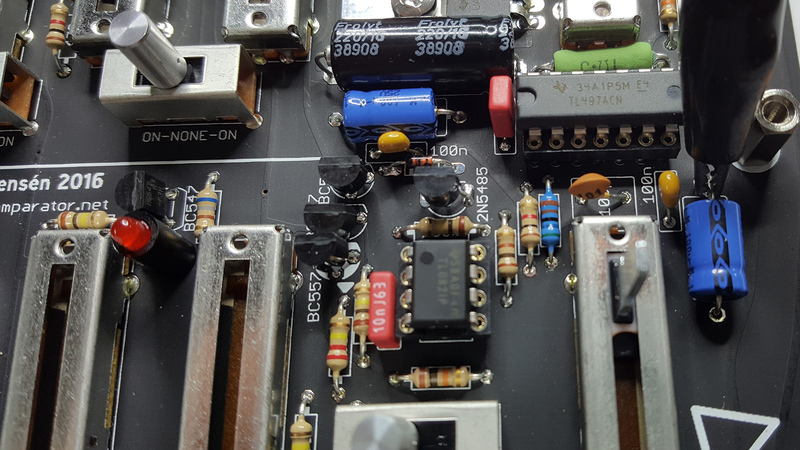 This article is about the well discussed problem of the brilliant SY-1 clones of ‘The Human Comparator’ from batch 1 – some units suffer from noise in the audio signal coming from the negative power supply. It’s a very ennoying high frequent noise getting (stangely) loulder when pulling the levels sliders down. Even with levels up the noise is still present, dependent on the settings of the other parameters. 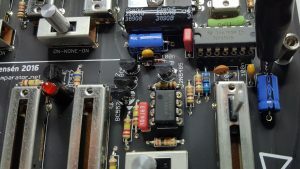 The noise comes from the TL497 voltage inverter who converts a positive voltage into a negative by some internal high frequency current pumps (or whatever, no idea, just guessing). Some Syncussion-Users seem to be disturbed more by this noise than others, for me it was DEFINATELY to loud. 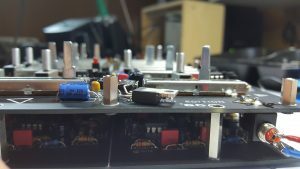 In the meantime there is another clone on the market from PsyCox who seemed to have solved this psu noise problem, he posted his filter schematic on gearsluts. I tried to set it up on breadboard but it somehow did not work for me, maybe the tolerances of my parts were too large and the filtering therefore did not work well. My next attemt was to try another voltage inverter. Most Shruthi filter boards use the LT1054 for generating the negative voltage. To go sure i hooked up a clean test setting: the PCB wire of the -8V-rail was cut directly after the PSU and both cables (-8V output of the PSU and the -8V input to the electronic) were soldered to a flip switch. 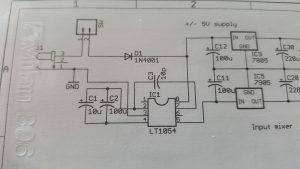 The third connector of the switch was soldered to the -8 V output of the breadboarded LT1054 which was feeded directly by +12V and got a 7908 regulator on it’s output. 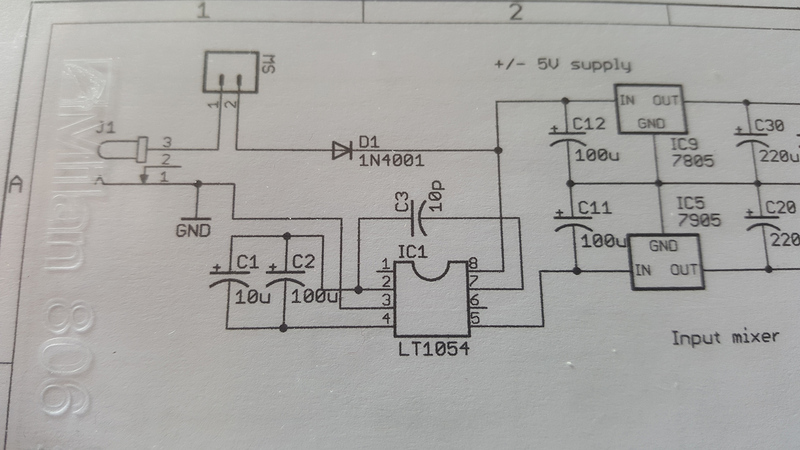 This allowed easy comparing if the noise will disappear and if the sound of the whole unit will change using another inverter (why should it?). Guess what – the noise completely disappeared and the sound of the unit did not change. After switching to the Shruthi -8V there still was a slight sizzling in the audio path. This came from the TL497 soiling into GND as it was still under voltage. Taking it out also removed the sizzling. 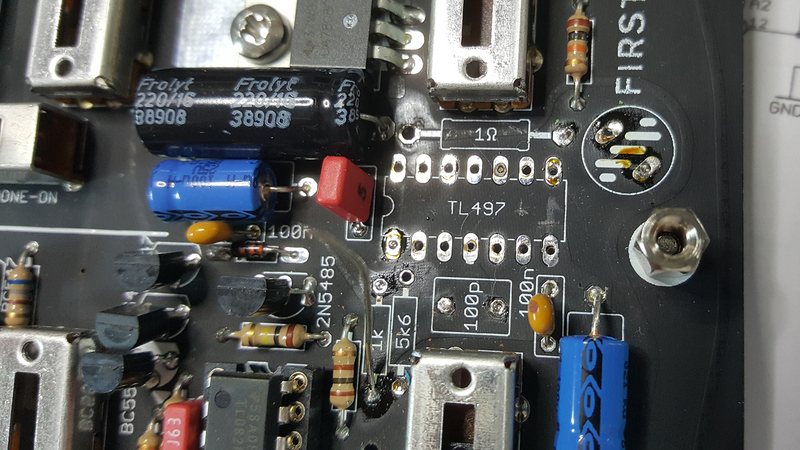 LT1054 and 7908 voltage regulator do not even get luke warm. 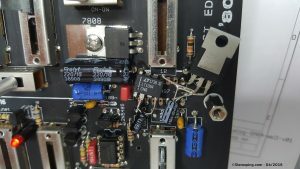 You might ask why not to connect the inverter directly to +8V to get rid of the 7908 regulator; i tried, it did not work. 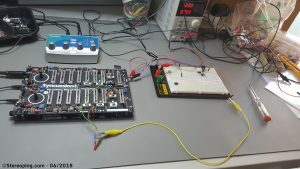 The output drops to -7.6 V, the VCAs did not close full anymore. So i decided to invert the full +12V and keep the 7908 regulator. The conversion looks chaotic on the first glance, but mechanically it’s quite stable and the height perfectly fits unter the metal cover. First i removed all unused parts to make space for the new ones. Even the IC socket will be desoldered. I cut the plastic housing on the small sides and wiggled the halfes until the legs broke apart. Then i pulled the legs out (with some tweezers) and cleaned the pads with desolder braid. Also removed: the 1-Ohm, 1k and 5.6k resistors, the coil and the 100p cap. 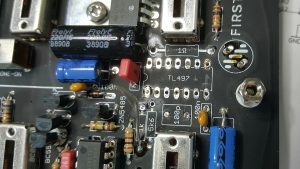 C34/1n also can be removed, it’s still on the PCB in the picture. KEEP IN PLACE: 100n and 100µ, we will reuse them for the output of the 7908 regulator. Now we look (better: MEASURE) which old pads of the TL497-IC we can reuse. 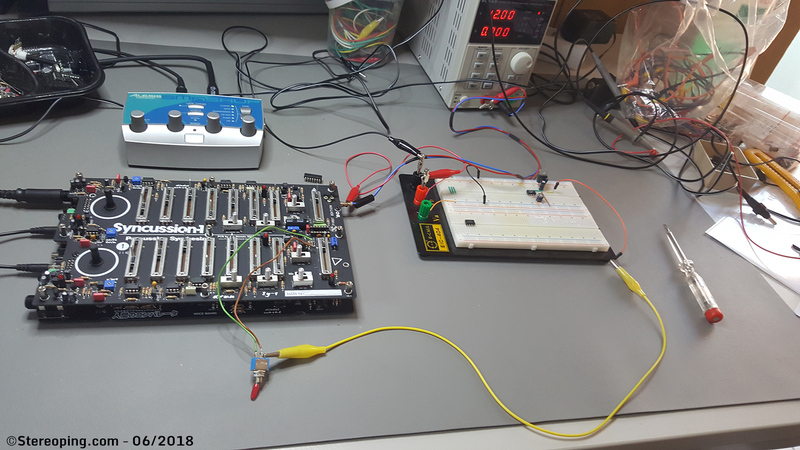 There are Pins 2 & 5 against GND as well as Pins 4 & 7 which will be connected to the output of our 7908 – this is the -8V output supplying the whole electronics. 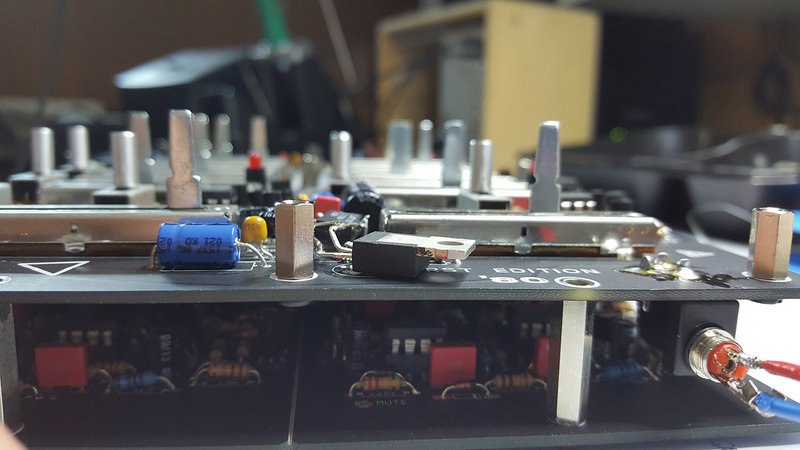 Luckily we still have two handy caps (100n, 100µ) on the PCB which will help keep the 7908 output voltage clean. The left pad of the 1 Ohm resistor feeds the +12V of the input voltage, this is the input (Pin 8) of our LT1054. The rest will be wired freely. For the remaining capacitors (7908 input and LT1054 between Pin 2 and 4) i used 10µ, although the Shruthi-Schematics suggest 100µ or 220µ. A mesurement with the oscilloscope did not show any benefits or problems using 10µ instead of 100µ and the 10µ is nicely small. 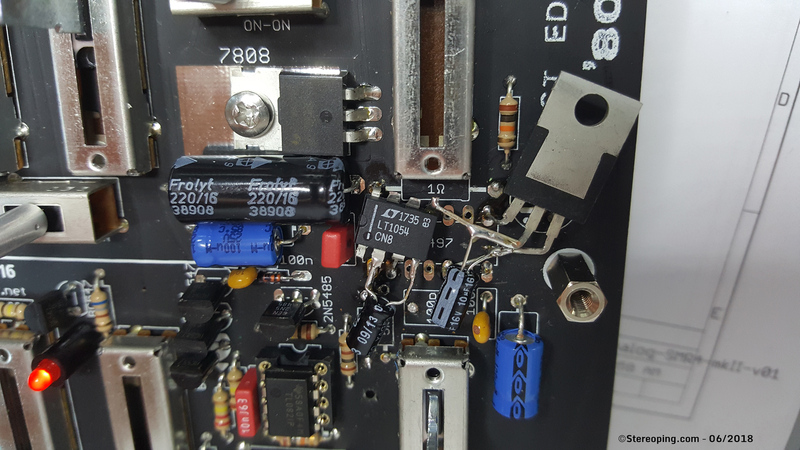 Keep in mind: as we got a negative supply here the Minus-wire of the capacitor gets to -8V and not to GND! I completely omited the 10p cap between Pin 2 and 7. I could not measure nor hear any difference if it’s there or not. The 10µ elkos can NOT be omited unfortunately, they are a must. Little video for evidence. The output of the SY-1 was sent through a compressor to push up the noise for easier before/after comparison.